After a 15-year break from filmmaking, legend Warren Beatty returned with 2016’s Rules Don’t Apply. 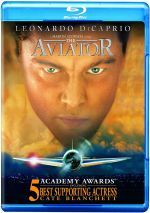 Set in Hollywood circa 1958, we follow employees of billionaire Howard Hughes (Beatty). Accompanied by her overbearing mother Lucy (Annette Bening), virginal Virginia beauty queen Marla Mabrey (Lily Collins) comes to California to become famous. She gets a contract at Hughes’ studio, and Frank Forbes (Alden Ehrenreich) receives the assignment to serve as her driver. Hughes insists that none of his employees engage in romantic relationships with his actresses. Because Frank and Marla share an attraction, they put this policy to the test. Proof I’m old: I can remember when Beatty was a major star. I can’t say exactly when he lost his luster, but 1992’s Bugsy feels like his last gasp. Granted, Beatty chose not to work much after that. Prior to Rules, Beatty directed only one film after Bugsy: 1998’s political parody – and flop - Bulworth. Beatty also acted in two other movies, 1994’s Love Affair and 2001’s Town & Country. Both failed to find an audience – and in the case of Town, Beatty endured a catastrophic bomb, as the $90 million flick earned a horrifying $10 million worldwide. Did Beatty’s radical decline in commercial fortunes contribute to his decision to step away from the silver screen? I have to believe it did – when you’re a major celebrity who can’t score a hit and also well into AARP years, there seems to be little reason to plug away at it. Rules seems unlikely to prompt Beatty’s desire to renew a more active career. It made a meager $3 million at the box office in the US – the same as Town & Country, though with a much lower budget. Perhaps if Rules wowed the critics, the situation would differ. However, it got completely middling reviews and made little impact in any forum. Which depresses me somewhat. Beatty created some good films in his career, so I find it a bit sad to see how much trouble he’s encountered with audiences over the last 25 years – not to mention the way the 2017 Oscars debacle will haunt him. On the surface, Rules seems like a good bet to mark Beatty’s return to form due to its potential reflection of his own life. It seems non-coincidental that the film takes place in 1958 – the year after Beatty himself arrived in Hollywood. While the story shows virtually no hints of autobiography, it still comes with the potential to act as a fond remembrance of Beatty’s early days. Too bad Rules never shows any affinity for the period or subject matter. Honestly, I wish Beatty had opted for autobiography, as Rules might then show some insight or cleverness or basic warmth. Instead, Rules becomes an odd, awkward amalgam of genres and story elements. Half of the movie relates to the Frank/Marla relationship – and an unusual love triangle that develops – while the other half digs into Hughes’ story, with an emphasis on his increasing lack of mental stability. Either of those themes could create an interesting – if unoriginal – film, but when stuffed together into one movie, the end result flops. Rules lacks even the most basic sense of coherence, as Beatty skips and hops from one plot point to another with little logic. This becomes an even more substantial issue during the film’s muddled third act. Never an especially smooth narrative, Rules goes totally off the rails during its final 40 minutes or so, and the movie can’t find any way to connect the dots in a sensible manner. Really, it often feels like Beatty came up with two movie ideas: one about the young lovers and another about Hughes. Whether because he didn’t want to commit to two separate films or because he feared he’d not get financing for both, it seems like Beatty decided to mash both concepts together into Rules - nevermind that the plots don’t come together in a sensible manner. On the positive side, Ehrenreich and Collins create a fairly charming couple, and Beatty manages to pack the cast with lots of notable talent. In addition to his wife Bening, we get work from Matthew Broderick, Candice Bergen, Ed Harris, Alec Baldwin, Martin Sheen and other “names”. These stars add a little luster to the proceedings. But not enough to allow Rules to prosper. The movie’s basic incoherence remains its biggest flaw, as Beatty can’t tell a concise or interesting story. Rules shows promise that it never fulfills. 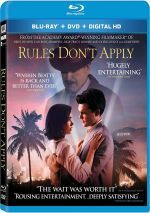 Rules Don’t Apply appears in an aspect ratio of approximately 1.85:1 on this Blu-ray Disc. The movie enjoyed an excellent transfer. Rules heavily embraced Hollywood Standard orange and teal. Within those parameters, the colors appeared clear and concise. Blacks were deep and firm, while shadows showed good delineation. All of this left us with a great transfer. One shouldn’t expect much from the movie’s DTS-HD MA 5.1 soundscape, as it remained decidedly low-key. Music showed good stereo imaging, and effects used the side and rear speakers in a gentle manner. Not much occurred in this regard, though, so the mix seemed rather restricted – even potentially active scenes like those at parties or restaurants lacked much scope. Only minor extras appear here, and we find a featurette called This Is Rules Don’t Apply. It lasts 21 minutes, 30 seconds and offers notes from writer/director/actor Warren Beatty, cinematographer Caleb Deschanel, production designer Jeannine Oppewall, costume designer Albert Wolsky, and actors Annette Bening, Alden Ehrenreich, Lily Collins, and Matthew Broderick. “This Is” looks at the project’s development, story/characters, cast and performances, cinematography, costumes and period design. The featurette provides a reasonable look at the different subjects. While it never becomes especially deep, it also lacks much of the usual puffery, so it fares pretty well. Next comes a music video for “The Rules Don’t Apply” by Lily Collins. It melds the song with movie clips, and it’s a snoozer. A Gallery ensues. It presents 38 images from the film and lacks much to make it interesting. The disc opens with ads for Hidden Figures and Papa Hemingway in Cuba. Sneak Peek throws in a promo for Fargo Season Two, and we also find the trailer for Rules. A second disc presents a DVD copy of Rules. It features the same extras as the Blu-ray. After a long layoff, Warren Beatty comes back to filmmaking with a thud. Though ambitious, Rules Don’t Apply fails to create an effective, coherent narrative. The Blu-ray boasts excellent picture as well as adequate audio and a few minor supplements. I wanted to applaud Beatty’s return but Rules fizzles.